The grumpy-looking, gelatinous blobfish has won a public vote to become the official mascot of the Ugly Animal Preservation Society. This gives the fish the unofficial title of world’s ugliest animal. The society began as a science-themed comedy night and devised its mascot campaign to draw attention to “aesthetically challenged” threatened species. The winner was announced at the British Science Festival in Newcastle. The blobfish tops a list that includes the huge-nosed proboscis monkey, the similarly afflicted pig-nosed turtle and others. Biologist and TV presenter Simon Watt, president of the Ugly Animal Preservation Society, said he hoped the campaign would draw attention to the threats facing these weird and wonderful creatures. Mr. Watt said he hoped the vote would also bring a lighter side to conservation. For this campaign, he worked with comedians, each of whom created a campaign message on YouTube for their chosen creature. The society asked the public to vote for their favorite. 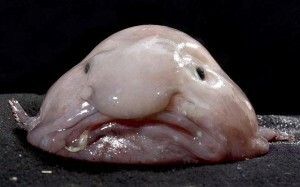 The blobfish eventually won by almost 10,000 votes. The bizarre creature lives off the coast of south-eastern Australia and Tasmania, at depths of between 600 and 1,200m, where atmospheric pressure is several dozen times higher than at sea level. Its gelatinous body is just slightly more dense than water, and it spends its life “bobbing around” in the depths. It feeds on crabs and lobsters and so suffers a significant threat from fishing trawlers. Although it is inedible itself, it gets caught up in the nets. Other animals on the shortlist face similar threats to their habitats and Mr. Watt hopes that this campaign will highlight the fact that conservation should focus on the protection of habitats rather than specific species. The kakapo: The world’s only flightless parrot. This heavy bird evolved in an island “bubble,” with no natural predators. But its New Zealand home now has many mammals, including humans, that have decimated the population of the famously curious kakapo. According to the International Union for Conservation of Nature, there were just 126 of the birds remaining in the wild in early 2012. The axolotl: This is the salamander that never grows up. The amphibian spends its entire life underwater, unlike other salamanders, which develop the ability to breathe out of the water when they mature. The axolotl’s perpetual state of larval development means that it is able to regrow lost limbs. It also means the creatures are of huge interest to scientists; the salamanders are studied for their apparent natural resistance to ageing and cancer. They live only in a small cluster of lakes in Mexico that are now becoming dangerously polluted. The Titicaca ‘scrotum’ water frog: This amphibian lives only in Lake Titicaca in the Andes. It has evolved a reduced lung capacity, so its many skin folds help it to breathe. According to some researchers’ accounts, the frogs do “press-ups” at the bottom of the lake to create disturbances in the water that increase oxygen flow. The proboscis monkey: As well as a very oversized nose, this primate also has a rotund appearance, which is a by-product of its diet of unripe fruit. Only the males have such large noses and, although they might look odd to us, it is thought that they make the primates more attractive to potential mates. The campaign was run in conjunction with the British National Science and Engineering Competition. For eight years, Eliel Santos has been using dental floss and mousetrap glue to reel in gold, jewelry, electronics and cash trapped beneath city sidewalk grates. “If you drop it, I’m going to pick it up – so be careful,” advised Santos, 38, a Puerto Rico native who lives in The Bronx. When The NY Post followed Santos on a fishing trip earlier this year, he hauled in a green iPod Nano in Times Square, a fake gold necklace, and a pocket full of change along Broadway between 23rd and 47th streets. He wastes no time, walking quickly from one side of the street to the other, his head cocked as he peers with laser focus into the darkness below. Suddenly, like a heron zeroing in on a creek minnow, he freezes and stands over his target. He quickly lowers the sticky lure, which he controls with the precision of an archer. With a fatal strike, his prey is snagged. “Just a quarter,” he says, stuffing the coin in his pocket. He pays particular attention to areas where tourists are exchanging money with street vendors. “They sit down to get a portrait and their money falls out,” he says. Santos ran to a store to buy a mouse trap – he guessed the tacky glue would do a better job than chewing gum. He affixed the glue to a rock, tied a string around it, and lowered the contraption down about 15 feet. In no time, the keys were secured. “He said, ‘Oh man, that’s awesome!’ – and he gave me $50. I thought, ‘Wow, this is a good way to make money!’” Santos said. Over the years, Santos has perfected his gear. He ditched the string because it was too fragile, experimented with fishing line but found it too inflexible, and now uses dental floss exclusively – 120 yards worth of Aim brand. “It’s only $1.19.” The line is MacGyvered with black electrician’s tape to differed sized weights – found metallic objects – to accommodate even the narrowest grate. He changes the Blue-Touch mouse glue about three times a shift, which spans generally from 9 am to about 2 pm. To snag cash, he uses a tiny fishing hook that he’s straightened out like a spear. Heavy objects are hauled in using two or more glue weights, and a traditional fish hook is also used on occasion to grab hard-to-snag earrings or chains. Sometimes he uses a pair of binoculars and a flashlight, and he’ll wear purple rubber gloves on occasion. “In case it’s in toxic water,” he explains. 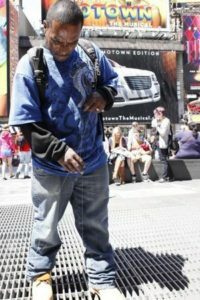 Lately, he’s been hauling in iPhones from the bowels of Times Square – three at one particular spot, he says. “When people text while they are standing on a grate, their phones fall in,” he shrugs. Each day, he marks down on a map where he’s been, so as not to return too soon. “I leave time for people to drop stuff.” Thursday to Sundays are best, especially in June and July. The day after parades are windfalls – revelers earned him $73 dollars in just one hour’s work after one parade this year, he recalls. For the past 20 years, Janice Keihanaikukauakahihuliheekahaunaele has had to carry two identification cards. “The county has never accommodated my name on my driver’s license,” Keihanaikukauakahihuliheekahaunaele said. Instead, it drops the 36th letter of her last name and doesn’t print her first or middle name. So she also carries a state ID, which in the past, included her full name. 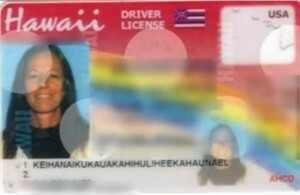 “The governor’s office went back into the computer department and they found a way to put our name on our state ID,” Keihanaikukauakahihuliheekahaunaele said. But when her state ID expired in May, her new ID came back just like her driver’s license. She says it’s created a number of problems from not being able to travel to being questioned by police during a traffic stop. Keihanaikukauakahihuliheekahaunaele says she’s been told by the county to take her maiden name or even shorten her last name. But that would mean taking away the one thing she still has from her husband, who passed away. “And I went, ‘How disrespectful of the Hawaiian people,’” Keihanaikukauakahihuliheekahaunaele said. She reached out to KHON2′s Action Line to find out if anything can be done. KHON2 pressed the Department of Transportation for answers. “We have been made aware of that issue and I know right now they are working to extend that limit to, I believe, 40 characters so that issue can be resolved,” DOT spokesperson Caroline Sluyter said. It comes as a relief to Keihanaikukauakahihuliheekahaunaele. “I really, really appreciate any attention to this issue because it’s not only for me, it’s also for those who come after me who also are going to be dealing with this in the future,” Keihanaikukauakahihuliheekahaunaele said. UPDATE: Hawaii changed the state policy after KHON2 aired story about Janice Keihanaikukauakahihuliheekahaunaele. The state says by the end of the year, it will increase the number of allowable characters. There will now be 40 characters allowed for the first name, 40 characters for the last name, 35 characters for the middle name, and five characters for any suffix. From The BBC, NY Post and khon2. com.